Print personalised ‘mobile mini billboards’ and help your customers and staff get organised while gaining repeated brand exposure! 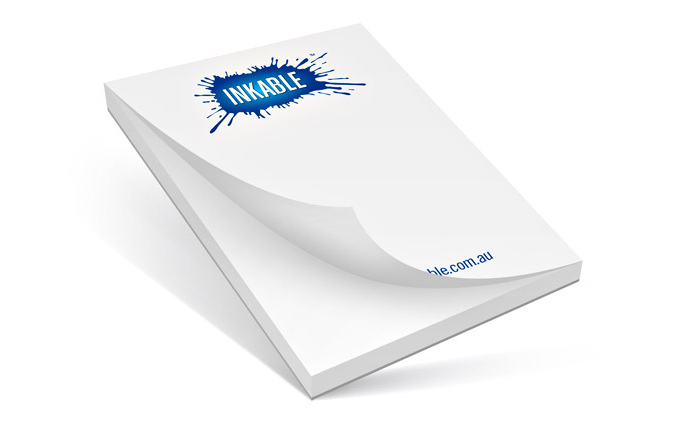 Inkable’s Custom Notepads are practical and professional gifts or promotional products that help advertise your small business every single time it is used, with impressions that multiply every time a note is passed along to other prospective customers. Always visible, hardworking, and one of your customers’ (or your own office’s!) home and work essentials, this product is perfect as useful branded NOTEPADS, MEMO PADS, SCRATCH PADS, part of your branded MARKETING KIT for people to use and share, or even as tools specific to your profession (DOCTOR’S PRESCRIPTION PADS, DRAWING PADS, LEGAL PADS, TO-DO LIST/PLANNERS, HOTEL NOTEPADS), and bonzer professional MONOGRAMMED NOTEPADS for your consultancy, firm, or local small business. We offer a variety of Custom Notepad options suitable for every small business need. Inkable uses bright and opaque quality 100gsm stock glued at the top with a sturdy 300gsm cardboard backing. High volume print runs with offset give you the best notepad prints, in either 50 sheets or 100 sheets per pad. CUSTOM SIZES: These are not available through our online system. For specific sizes, please use our Custom Order Form. Custom notepads are often overlooked as branding materials and might seem like a small thing to add to your branded print materials. Investing in high quality business cards might be your main workhorse when doing quick networking rounds, but it’s only right to add notepads as leave-behinds for enhanced brand recall. Personalised notepads speak a lot about your reputation and professionalism as an established small business—generic ruled pads from nearby office stationers would never position you as a serious and established business. Include all important art elements and copy. Remember to maximise the repeated exposure of your brand by ensuring all the important details are included on your printed notepads and that these are strategically placed so that your prospective customers will remember you every time they use it. A photo can speak a great deal more than words. If your notepad calls for it and can accommodate, include pictures to help drive your message or brand promise better. Follow through is important—enhance your business and sales efforts/visits. Maximize notepads by encouraging feedback from your customers. Provide them with your contact numbers, office address, email address, website, and Social Media pages. Give your valued customers free notepads on your next client call to add continuity in your small business. If you have a vision but can’t do it on your own, get a professional to design your notepads. While notepad artwork is generally simple (header, footer, table for body content if printing a to-do list) designing clean and professional notepad layouts can still be tough. Consider outsourcing design, especially if you are looking to print a marketing set. This way, you are sure that everything is sharp, properly prepared for printing, and will therefore get good results. Decide on an appropriate and consistent layout: Your layout is the cornerstone of your design. It should draw your user’s attention to interesting details and branding elements while being unobtrusive enough that it does not make the notepad pages look like sales sheets or advertisement space. Be sure to set standard margins and don’t overdo design effects, and make sure text is delivered in bite-sized pieces. Pick a font and a font color scheme that agrees with your brand’s personality. Set different fonts for your headings and text body. Keep in mind that headings must stand out as well as subheads, and important notes must also be set in a different font style or color. By doing so, your text is ogranised and does not come across as too cluttered, giving ample breathing room for the usable white space. Use appropriate paper. Part of how well your customers and office staff receives and repeatedly uses your notepads will depend on the quality of the paper you choose. The right type of paper can give you a professional and put together image. Apart from your sales notepad distribution schedules, always be prepared and bring along copies to give away at trade shows, meetings, and other opportune events. Store copies in your car for unexpected run ins with a possible prospect.